Remember when I was all like, “There was no love triangle.” from my review of Delirium? Yeah…I’m thinking I got a bit ahead of myself there. Let me just say this: the entire second book is different from the first. The ONLY thing that is the same is the name of the main character. She is not the same, she is harder, stronger, and rougher. She has to be. The world, while controlled by the same society, is now completely different because Lena is on the outside. This was a good second novel, but I am not sure that it will appeal to people that loved Delirium. On the other hand, if you only kind of liked Delirium, if you thought it was slow, give this one a read. It is much faster paced, and one of the things I really did like about it was that it kept going back and forth from where the story left off in the first book and where Lena was at that moment. Then, Now. Interesting and Lauren Oliver is a fantastic writer, so she pulled it off. The larger themes of this book are just like every other dystopian novel. Actually, like a lot of YA dramatic trilogies. You have all the basic ingredients. The horrid society, hunting the main character(s), a twist at the end, and of course….if you didn’t already know….Lena falls for boy #2 in this book. The whole romance is not something I can avoid, so sorry if I spoiled it for you. It is something that I have to address. More on that later. The end also has a rushing climax of events that end in a cliffhanger. That you see coming a mile away if you have half a brain. This story takes place in the Wilds. In the woods and rough land between the cities. Lena also spends time in NYC, a dank underground cell, a sewer, a safe-house, a city, and in a cellar with a community of misfits. So not a lot of time to really get into the setting, which is totally unlike Delirium. This story takes place in the future, after the United States closes its borders to outsiders and walls off it’s major cities and attempts to rid this new world they have created of love, or amor nervosa deliria. According to them, the sickness is the cause of most major illnesses, depression, suicide, and so on. 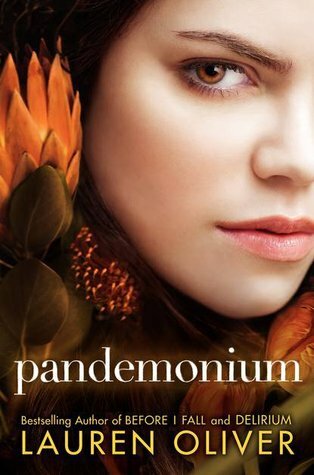 Pandemonium takes place both a good chunk of months after Delirium ends, and right after Delirium ends. It goes between the “Then” and “Now” stages of Lena’s development into a new tougher Lena. I still love Lauren Oliver’s writing. (see what I did there with the “still?” that means something bad is coming…) She is a great writer, and I flew through the book because I wasn’t caught up on stupid mistakes with the grammar, with the characters or plot, or with poor wording. Her work is very readable. I also still like Lena. She has grown a lot, although I am not sure I believe the total growth by the end of the book. That she was willing and capable of doing what she did at the end….I just don’t know. But I like her. Okay…and now….for the dislikes. Unfortunately, even though I am dying to read the next book, I have to say I was soooooooooo SO disappointed in the ending of this book. It’s not really how it ended, which I did see coming throughout the entire book, but the last…oh probably third of the book. Totally predictable, totally easy and I just kept thinking, no way. Not only was Lena able to do one very improbable thing after another, but then…well, without giving anything away, let’s just say that it was too convenient. It all happened quickly and much too easily and I just didn’t buy it. And then, the end. It left me with a bad taste in my mouth. I was still hoping that something unpredictable would happen. I guess I can say, I wasn’t expecting the reaction I was to what happens. But that, too, made me not like what was happening. Of course, Requiem may redeem the series for me, and so I wait for that. ps-Here’s your Just For Fun: In 1982, an apparently (4/10 stars on IMDb) terrible movie came out with the name “Pandemonium.” Here’s the synopsis: “Tom Smothers stars as the brave mountie, who along with his trusty horse and bitter deputy Paul Reubens must track down a killer who is stalking coeds at a nearby cheerleader camp.” It sounds so god-awful, you might just want to check it out. If you can find it. It spoofs a collection of horror flicks from the era. If you want some laughs, check it out.